As readers of romances, you know that writers love to talk to you. We're thrilled to get mail and to see you at various events. Well I'm going to a reader event next weekend. It's the Barbara Vey Reader Appreciation Weekend. For the past six years, Barbara has been staging this event in Milwaukee, WI. It has limited space, so it's a thrill to be invited. I've been invited three times and it's an event I wouldn't miss. Talking to readers, who wouldn't want to do that? Not me. Authors decorate their tables to thank the readers for their loyalty and continued support. This was my table decorations the first year. My theme was a wedding and I folded those napkins in the form of a tuxedo. But the wedding table that was absolutely fantastic was Tina DeSalvo's. She built a wedding cake out of little cake boxes. Authors are limited to sixty and there are 500 readers. It's nirvana for an author. Unlike conferences were you go and sit around in workshops learning a skill or discussing an area of writing, here we meet, greet, talk and have fun. Just look at Susan Elizabeth Phillips. In 2017, I went with a Christmas theme. The photo doesn't show it, but there are lights in each of the bird cages and books all over the tables. 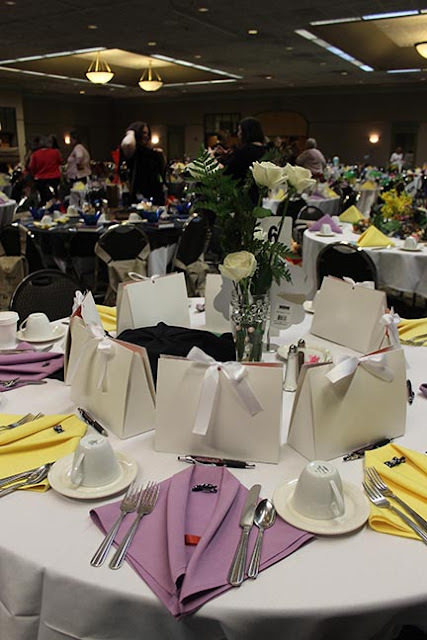 The main event is a huge luncheon at which the authors decorate their tables and provide appreciation gifts for the readers who have chosen to sit with them. This year, I'm going with a Cinderella theme. Cinderella is one of my favorite themes for both reading and writing romances, so it was an ideal pick for me. Below is my centerpiece for this year. 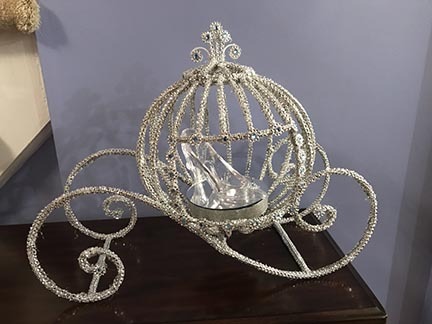 It arrived as a white metal carriage and I decorated it with diamond wrap for the frame and rose wrap for the embellishments on the wheels, crown and doorway. Improvising the seat and glass slipper took a little thought, but I love the way it turned out. Some lucky reader gets to go home with it. I wish you could see it in person. The photography (mine) doesn't look as good as the carriage does. So you can see, we really appreciate our readers. Thank you who read our Heartwarming books and maybe there's someone out there who'll be in Milwaukee next weekend. If so, see you there. Have fun, Shirley! What a great time. Thanks. I'm still making my decorations, but I am so looking forward to this. Every year Barbara puts out a google doc for authors to sign up. It's comes through her Facebook page. She only accepts 60 authors, but wants a variety. The same authors don't come every year. Put yourself on the list next time. I think she does it around August. Wow! Your decorations are all lovely, and so creative (I have no artistic ability), but that carriage is gorgeous. Have a great time! I love crafts. I did them as a child and I still love making things. I know of some writers who have gone to the event and it is prized. I wouldn't have any trouble talking to readers. I can talk to anyone--used to get put in the closet at school for talking too much. LOL. But to do a table like you've done would freak me out. Yours are gorgeous. Some are more elaborate than others. The first year, I only had the folded napkins and the bags tied as wedding gifts. On the chairs were books. There are only 8 seats toa table, so you need seven gifts. This is the epitome of reader/author events. I've loved your posts each year. But, seriously, Shirley, that Cinderella carriage is incredible. 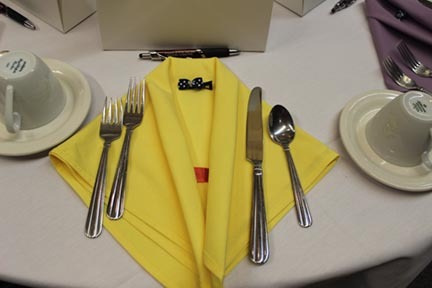 I loved the tuxedo napkins, by the way! What a lucky group of readers who not only get to enjoy your company, but a chance for that carriage. WOW. I would be wringing my hands trying to come up with a theme. I'm so not a theme person. Have fun! Just as your characters for the theme. Since a lot of my book use the Cinderella theme it was a good choice. Alex Kava's table was a crime scene. She had the yellow and black tape, Scotland Yard hats and magnifying glasses. There were people with miniature hot air balloons. One centerpiece was a small carousel. 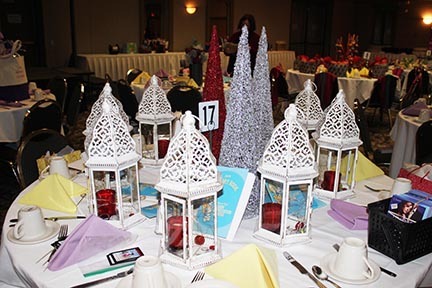 the creativity is great and you get ideas from other tables. Wow! You have some amazing decorating talent! Have a wonderful time. This is so very cool, Shirley. 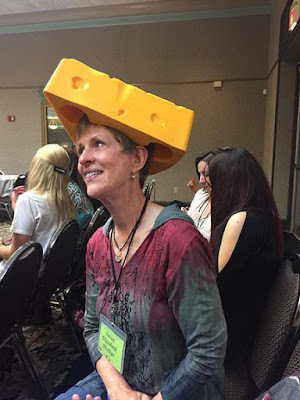 About three years ago, the Wisconsin RWA chapter had its conference to coincide with the Vey event, so I know how much fun it is. Some of our authors take part. But Susan aside, be like all the politicians and don't let anyone take a photo of you in a cheese-head hat. It come back to haunt you! Have fun with the readers--and the other authors. I thought so too. When they passed the cheese to me, I passed. Susan is a great sport. I don't envy many people...but your talent for decorating makes me green! ;-) Have fun this year and I love both the tuxedo napkins and the carriage. Thank you I love that carriage. It turned out much better than I thought it would. What a fun event! I hope you really enjoy it. I'm not sure my comment registered.. So commenting again! I'm glad you liked my table! 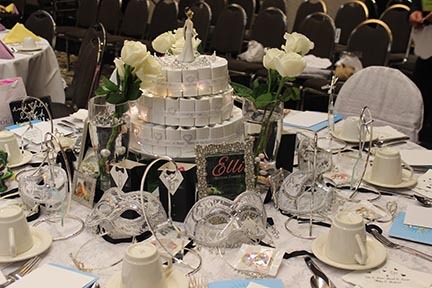 It was so fun decorating that wedding themed table for my 3 Novels and 2 Novellas of the Second Chance Novels! I love going all out! Lol. This is such a fun event- The readers are fantastic- so welcoming. I look forward to seeing you there! I'll have the return visit of my Cheese Heaf for all to wear! Barbara Vey and her amazing committee sure put on a great weekend! What a gem of an event! And how you've turned the carriage into a magical item...Wow! What an enchanting event. Thanks for sharing, Shirley!